Just because there’s ice on the water doesn’t necessarily make it cold, does it? I was nice and warm on the shore. I think I may have underestimated loons. When I think of loons, my mind goes back to a glass-calm lake reflecting a a gorgeous northern sunset. We were quietly paddling through the lake while listening to loons calling out from either side. It is a fond memory that I will keep forever. On top of all that, it occurred to me that loons have yet another remarkable trait that even humans would do well to mimic. Loons quietly go about their business, draw no attention to themselves and don’t even make a sound until they have something profound and beautiful to say. I wonder if someone could teach that to geese? Just so you know, I politely offered a kleenex to the loon but it didn’t seem to want it. Lovely pictures. Bring back memories. Growing up in Minnesota, we went camping every summer. I can still hear the echoing calls of the loons at dusk. Thanks. They do have a way of creating a wonderful memory. I was so pleased to share some time with them. Like the composition of the second picture. The water droplet adds to the appeal. Nice catch Lyle! Why is it that no supermodel–male or female–would look half so good with a big drooly drop of H2O hangin’ off her/his perfect nose, whereas that drippity black-toned Beak Boy looks ROCKIN’? OK I’m laughing too hard to come up with a good response!!! “Drippity black-toned Beak Boy” – where do you come up with this stuff? I will never forget that a rockin’ loon trumps any supermodel. Thanks for dragging the talk down. Regarding the conversation above with Gunta about geese flying overhead. Aside from their call, I love the sound of their beating wings as they pass above. It is surprisingly loud…much like the loon’s call when close. But I do agree…there is nothing to compare with that lonely call singing out in the fog in a remote lake to let you know that you are in wilderness. Here’s a short YouTube of loon sounds. https://www.youtube.com/watch?v=hrkn_-pjVUE for Gunta. Those loons didn’t seem to have any issues swimming around the ice. They clearly have more protection than me. I recall a different time we were standing at the shore when the lake was frozen over on a calm day. We heard this strange and finally figured out it was the sound of the wings on a small bird passing by. I had never heard that before. With much larger wings the geese are easier to hear. I enjoy all those sounds. I couldn’t resist clicking on your link and hearing the loons again. These are real beauties! That loon call is something you never forget for sure. I wish our local tourists and photographers could learn to quietly go about their business. Birds are often much smarter then given credit. Thanks. It’s interesting to note of all the sounds which ones are the most memorable. There are occasions when the wisdom gap between humans and birds is a lot smaller than we think. Two beautiful images of a stunning bird, here in the UK we call Loons “Divers” and we refer to this bird as a “Great Northern Diver” when Loons are in their summer plumage (as in your shots) I always think their plumage looks like silk, excellent shots indeed Lyle. Thank you. I didn’t realize they went by different names in the UK. I appreciate you making me aware of that. Silk indeed – I like that description as well. Beautiful images Lyle. I agree, the geese could take a few pointers from the loon. I just wanted to mention that we have a black bear in our area. I did not see it but another photographer made a video as the bear came right up to him. The guy moved and the bear darted away. Maybe I will see a bear in the woods one day. Glad you enjoyed them. I hope you can safely enjoy seeing the bear some time – that would be a treat. It sounds like the bear is properly fearful of humans so that’s always a welcome sign. Thank you for the beautiful images of the loon. The final one is remarkable. On the call of the loon, I have heard “haunting” and “penetrating” used to try to characterize the effect it has on us humans. More poetically, I suppose, someone spoke of the call as one that somehow seems to connect the “here” with “hereafter”. I can’t speak to that further except to say that it seems to connect hear with hearafter–the echo in the mind continues to resonate long after the initial experience. I might add, something like your photography, Lyle–the image lingers and invites deeper reflections. I appreciate those thotful and inspiring comments. I do find the loons call somewhat haunting which adds to its mystery. Any time I think of the loon, I can taken back to its call and the positive memories it retrieves. Absolutely some sort of poetry. Beautiful loon photos, Lyle. I see them over on the Oregon coast when I visit there now and then. The wildlife rescue station said they need water to take off and land, and they often get stranded on the beach during a storm, flopping about until the tide comes in. Geese, like humans, are wired for sound. They do make great watch dogs for chickens, and even traveling companions. My sister and her husband used to go for neighrborhood walks with their goat, chicken perched on the goat’s back, and their geese in tow, commenting on everything. Quite a sight! the geese learned how to “knock” on the door in the morning, letting the family know they were up, and hungry. Thanks. I didn’t realize that loons needed water to take off and land. Your description of your relatives sounds like it’s a prime candidate for some kind of TV show. That’s hilarious. It’s always amazing what animals can do. I didn’t know loons needed water take off either until our first trip to the coast here. There was a very bad storm that Thanksgiving weekend, and the beach was littered with debris as well as many dead or dying birds. We found this one bird, weak, but still had some life in him. Called around, and ended up driving the bird up from Yachats to Newport, where rescue workers fed him some special liquid emulsion to rehydrate the bird and give him energy. He was released the next day on calm water. The facility was nice and followed through with a phone call as to his condition. First time I has seen a loon that close! Lovely peaceful photos. Good luck with the goose training. I’m pleased I was able to portray a sense of peace because that’s certainly what I felt when I was there alone with the loons. I don’t hold out much hope for the geese training! Love the loon shots and enjoyed your commentary on human (and goose) behavior. 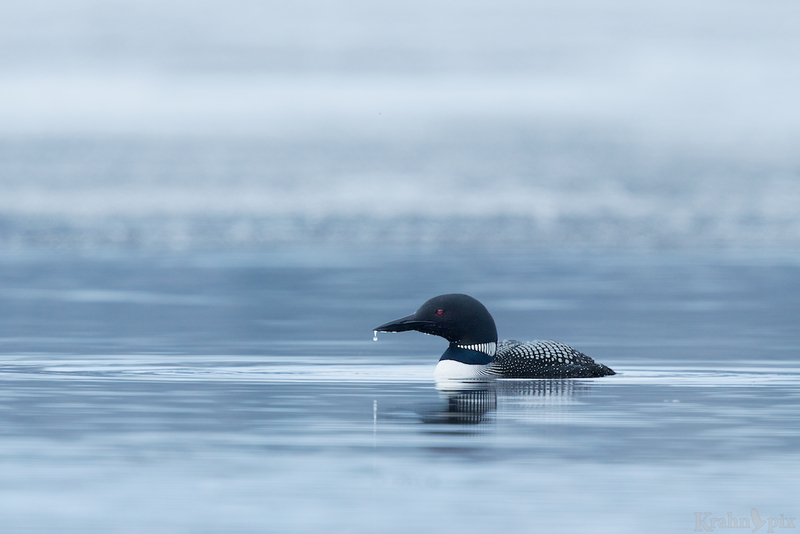 Compared to the ostentatious displays of color of many other birds, some might consider the loons as a bit drab–I too really like the colors and patterns of the loon and see it as a kind of understated beauty. You know that I like to analyze things and I have come up with a reasons to like the loon but I must confess it has an attraction I can’t full explain. And that’s probably OK. I like your understated beauty description. Happy to hear you enjoyed the post. Great photograph. I feel all the less Canadian for never having seen one live! That’s interesting. We certainly do live in a large country with different ecosystems. One of the many reasons we went to Ottawa some years back was to finally see maple leaves in quantity. Given the colourful carpet they provided in fall it was finally more clear to me how it ended up on the flag. Glad you enjoyed the loon. I like the the word majestic and would whole heartedly agree with that one. They have a mysterious quality to them somehow that I find particularly appealing. I actually didn’t realize they were in the Rockies as well. I just found the loon’s call on You Tube. Amazing. If I was sitting on beside a lake over there and heard that sound without knowing what it was – well, I think it may have made my hair stand on end. Oh yes I did forget to mention it has a haunting tone to it. Knowing what kind of creature it came from would definitely affect your perception of that sound! It’s always interesting to hear responses from people who are unencumbered with familiarity. Nice post…loons are common along Hood Canal, and after reading your post I too underestimate them; great photos and write up. Any place where you can find loons must be a good place! Glad you enjoyed the post. I just looked up Hood Canal and that is a great place. It is, and I agree with the idea that any place a loon calls home is a good place! Perhaps the geese get a bit loud at times, but I love the sound of their quacks as they fly overhead. To me it’s the call of the wild. Granted, I haven’t had much opportunity to hear loons calling, so perhaps I need that experience to properly compare. Come to think of it, listening to geese overheard is OK, probably because it’s further away and doesn’t last so long. Listening to the amazing call of the loon echoing over a lake is something I wish you could hear. Elegant bird, beautiful pictures. Thanks. Elegant is a great word to describe it. Glad you enjoyed it.